How often have you said 'If only I had more time?' Well, short of cloning yourself, you're stuck with 24 hours like the rest of us. But how you use it is up to you. By following our advice on getting those everyday chores done quicker, you'll have more time for the really pleasurable things in life. Declutter and reorganize. Take a weekend to get yourself organized. You waste so much time looking for the piece of paper you wrote the number on, the red shirt, or the car keys. Once you are organized, you have a place for everything, and actually put it back once you're done. 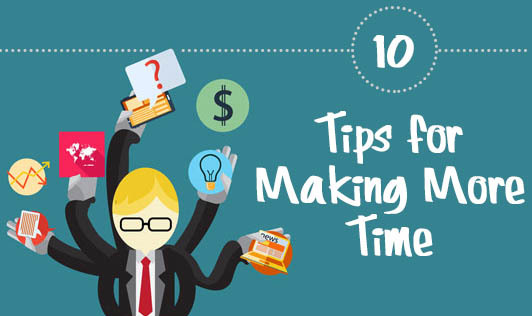 You'll be surprised at how much extra time you have. Be the early bird that catches the doctor, the dentist, and the bus to work. Book medical, salon, and other appointments in the morning. They always overrun so if you're penciled in at the end of the day, you're bound to be kept waiting a long time. Start surfing. Whether it's groceries, stationery, or lacy lingerie you're after, you can save yourself the ordeal of crowds and queues by shopping online. But make sure they offer a flexible delivery service. Be direct. Pay monthly household bills by direct debit. Online banking is also handy to keep your finances in order at the click of a button. Get cooking. When preparing dishes that can be stored, cook double of what you need and freeze for another night or take for lunch the next day. Just be careful you don't eat it all in one go! Iron ahead! Pick out and iron your work clothes the night before. This really does save you time, especially if you tend to over-sleep. Know the story? Worried that you're missing out on all the latest bestsellers or will never get round to reading those classics? Stay in the know by listening to audio books while you're driving, walking, or jogging. Friends united. Too many people, too little time? Get your pals together once in a while for a party or a fun game night. You'll be amazed at who gets on with whom, and it'll give your evenings a new lease of life! Learn the knack of getting two birds with one stone. If you live close enough, cycle, or run to work and save time and money while toning those thighs and firming up the wobbly bum. If not, then try cycling to your neighborhood shops on a Saturday. Don't procrastinate. The longer you put off a task, the more time you're wasting that could be used to do that task or something else. Make "do it now" your motto. There is still no magic formula to give you 30 hours in a day. But as soon as you learn how to make the most of your time, and make it a habit, you'll feel less rushed, get more done, and even have some time to relax!